ravel in style with your trendy License Plate Tote. This sewing pattern is easy and fun. Collect these FabricPlates™, during the Row by Row Experience™ in the Summer at different participating shops. 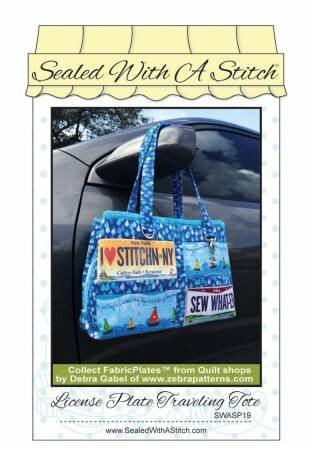 Then stitch up a way cool traveling tote to show off where you have been! Inside are two zipper pockets and a cellphone pocket, three swivel hooks and "D-Rings" from Patterns By Annie, In-R-Form Sew In Stabilizer or Soft and Stable, and four FabricPlates™ by Debra Gabel. Approximate finished measurement are 16" wide x 10" tall x 4" deep.